If there was one genre of film that silent German cinema was best at, it was tragedy. Tragedy in film often works best when witness someone’s life literally fall apart by the choices they make and not listening to it, and watch how the world goes from loving them and adoring what they’ve accomplished, to tossing them away like a moldy piece of bread. Several German films captured this perfectly, like “The Cabinet Of Dr. Caligari” and “Faust,” but now I can say that “Pandora’s Box” joins that group. 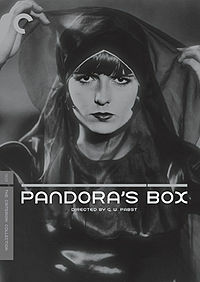 For a long time, I thought “Pandora’s Box” was a fantasy about the literal box given to Pandora that contained the world’s evils, but the film is actually about a young woman, Lulu (Louise Brooks), a temptress who enjoys using her ability to woo any and every man she comes across. Lulu isn’t afraid to flaunt this power over men in front of other men she has seduced, which leads to many of her men becoming jealous and resorting to dirty tactics to keep Lulu, which does not always work out in her favor. Very quickly, the title of the film becomes clear – Lulu is Pandora’s box. She tempts men to do terrible and evil things, just for the sake of lust and jealousy. To win her over and be with her is to become one with your inner evil, whether you know it or not. Lulu convinces a man twice her age to marry her after the two are caught at his son’s gala event. But even during their wedding reception, Lulu sneaks off to make out with several different men, including the groom’s son. Personally, I hated Lulu from the moment the film started. That is, until we reach the final act and we see Lulu at her lowest point. Suddenly, everything became clear – She cannot change who she is, a temptress. She has accepted this lifestyle and willing to live it to the end. Even if she’s dirt poor and on the run from the police, that’s not going to stop her from conquering another male. And in the end, she pays for that. That’s what makes “Pandora’s Box” a fascinating silent tragedy that is certainly worth checking out. Rather than relying on seduction through words and physical touch, this film is entirely about Lulu’s look and movements, yet she is able to do so much through that alone. While it is a bit slow at the beginning, it picks up near the end and has a great climax when Lulu’s fate becomes clear.